Kindest regards Tim Wood "
Flat Cover: Our most versatile cover. A good choice if your boat is often on the move. This design allows you to fix the cover over the dinghy with the mast up or down. Great for trailing and storage with mast up or down. Two halyard points in the centre of the cover prevents water gathering. Overboom: Ideal if your dinghy spends most of its time in one place. This design perfectly allows you to fix the cover over the boom with the mast up. Allows rain to run off easily, minimising contact with the deck, providing all-important air circulation. Trailing Cover: Our trailing covers are specifically designed to protect your dinghy whilst towing. They considerably reduce drag having no openings for mast and shrouds. Under Cover: Made from tough coated nylon, the snug fit protects the hull of your dinghy from wear and tear when towing. 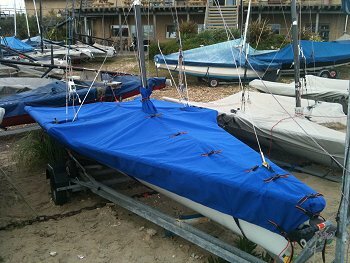 All our RS600 Dinghy Covers are manufactured in our factory in Southampton, we do not sell imported covers. We use only the best quality materials whether PVC, Polyester/Cotton, Hydralite, Nylon or Weathermax.